Sic Bo is a fast, exciting dice game. Though the name can be translated as 'dice pair', Sic Bo is played with three dice. 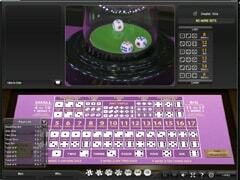 The dice are rolled inside a small bamboo cage or glass jar and players have a vast array of betting opportunities on the results of each roll. Like Dragon / Tiger, Sic Bo is a quintessentially Asian game, wildly popular with Chinese and Thai players, but mostly unfamiliar to Western gamblers. Because of this Asian focus, only five of our casinos offer Live Sic Bo. If you're a player from the UK looking to play Live Dealer Sic Bo, both our top-rated casinos (betfair and bet365) offer it. Playtech Asia provides the same feed for both casinos - the difference being in the table limits (betfair allows a wider range of bets). With only 40 games a minute, the pace can seem a little slower than at the other casinos, but these casinos deserve credit for offering an essentially Asian game to a worldwide audience. If you want more comprehensive information on Live Sic Bo, including rewards and banking information, we highly recommend our partner site Live Dealer Sic Bo, and if you need a reminder of the rules of Sic Bo, or want to study our Sic Bo strategy, have a quick read through our Sic Bo guide before you play. betfair offers only one Sic Bo table but offers decent table limits of £1 to £1,000. This is a payout limit, rather than a bet limit, meaning that the maximum payout on any bet is £1,000. The time between games varied from 74 to 116 seconds, giving an average of 40 games per hour. However we found that at weekends the game speed could be as fast as 45 seconds, giving 80 games per hour. Sic Bo at betfair is a fast and entertaining experience. There's a game every 90 seconds which includes 30 seconds in which to place bets. The Playtech feed is exactly the same as bet365's but betfair has the edge by offering larger table limits. The dealers change every 20 minutes, offering players a wide variety of personalities. The dealers each have their own individual presentation style - some are quiet, others cheerful, some very talkative. bet365 offers a single Sic Bo table in its Turquoise Room. Table limits are £5 to £200. This is a payout limit, rather than a bet limit, meaning that the maximum payout on any bet is £200. Sic Bo at bet365 is essentially the same game as you'll find at betfair. The only difference is in the amount you're allowed to bet. If you're a high roller, looking for large table limits, betfair offers the best experience. If, however, you're relatively new to the game and are trying Live Dealers for the first time, bet365 is the perfect environment to learn the game.